A Scan operation reads every item in a table or a secondary index. By default, a Scan operation returns all of the data attributes for every item in the table or index. You can use the ProjectionExpression parameter so that Scan only returns some of the attributes, rather than all of them. A single Scan request can retrieve a maximum of 1 MB of data; DynamoDB can optionally apply a filter expression to this data, narrowing the results before they are returned to the user. If you need to further refine the Scan results, you can optionally provide a filter expression. A filter expression determines which items within the Scan results should be returned to you. All of the other results are discarded. A filter expression is applied after a Scan finishes, but before the results are returned. Therefore, a Scan will consume the same amount of read capacity, regardless of whether a filter expression is present. A Scan operation can retrieve a maximum of 1 MB of data. This limit applies before the filter expression is evaluated. With Scan, you can specify any attributes in a filter expression—including partition key and sort key attributes. The syntax for a filter expression is identical to that of a condition expression. Filter expressions can use the same comparators, functions, and logical operators as a condition expression. For more information, Condition Expressions. The following AWS CLI example scans the Thread table and returns only the items that were last posted to by a particular user. The Scan operation allows you to limit the number of items that it returns in the result. To do this, set the Limit parameter to the maximum number of items you wish the Scan operation to return, prior to filter expression evaluation. For example, suppose you Scan a table, with a Limit value of 6, and without a filter expression. The Scan result will contain the first six items from the table that match the key condition expression from the request. Now suppose you add a filter expression to the Scan. In this case, DynamoDB will apply the filter expression to the six items that were returned, discarding those that do not match. The final Scan result will contain 6 items or fewer, depending on the number of items that were filtered. DynamoDB paginates the results from Scan operations. With pagination, the Scan results are divided into "pages" of data that are 1 MB in size (or less). An application can process the first page of results, then the second page, and so on. If the result contains a LastEvaluatedKey element, proceed to step 2. If there is not a LastEvaluatedKey in the result, then there are no more items to be retrieved. Construct a new Scan request, with the same parameters as the previous one—but this time, take the LastEvaluatedKey value from step 1 and use it as the ExclusiveStartKey parameter in the new Scan request. Run the new Scan request. Ordinarily, the AWS CLI handles pagination automatically; however, in this example, the CLI's --page-size parameter limits the number of items per page. The --debug parameter prints low-level information about requests and responses. The absence of LastEvaluatedKey indicates that there are no more items to retrieve. The AWS SDKs handle the low-level DynamoDB responses (including the presence or absence of LastEvaluatedKey), and provide various abstractions for paginating Scan results. For example, the SDK for Java document interface provides java.util.Iterator support, so that you can walk through the results one at a time. For code samples in various programming languages, see the Amazon DynamoDB Getting Started Guide and the AWS SDK documentation for your language. ScannedCount — the number of items evaluated, before any ScanFilter is applied. A high ScannedCount value with few, or no, Count results indicates an inefficient Scan operation. If you did not use a filter in the request, then ScannedCount is the same as Count. Count — the number of items that remain, after a filter expression (if present) was applied. If you do not use a filter expression, then ScannedCount and Count will have the same value. If the size of the Scan result set is larger than 1 MB, then ScannedCount and Count will represent only a partial count of the total items. You will need to perform multiple Scan operations in order to retrieve all of the results (see Paginating the Results). Each Scan response will contain the ScannedCount and Count for the items that were processed by that particular Scan request. To obtain grand totals for all of the Scan requests, you could keep a running tally of both ScannedCount and Count. Table The table's provisioned read capacity. Global secondary index The index's provisioned read capacity. Local secondary index The base table's provisioned read capacity. TOTAL—the response includes the aggregate number of read capacity units consumed. INDEXES—the response shows the aggregate number of read capacity units consumed, together with the consumed capacity for each table and index that was accessed. DynamoDB calculates the number of read capacity units consumed based on item size, not on the amount of data that is returned to an application. For this reason, the number of capacity units consumed will be the same whether you request all of the attributes (the default behavior) or just some of them (using a projection expression). The number will also be the same whether or not you use a filter expression. A Scan operation performs eventually consistent reads, by default. This means that the Scan results might not reflect changes due to recently completed PutItem or UpdateItem operations. For more information, see Read Consistency. If you require strongly consistent reads, as of the time that the Scan begins, set the ConsistentRead parameter to true in the Scan request. This will ensure that all of the write operations that completed before the Scan began will be included in the Scan response. Setting ConsistentRead to true can be useful in table backup or replication scenarios, in conjunction with DynamoDB Streams: You first use Scan with ConsistentRead set to true, in order to obtain a consistent copy of the data in the table. During the Scan, DynamoDB Streams records any additional write activity that occurs on the table. After the Scan completes, you can apply the write activity from the stream to the table. Note that a Scan operation with ConsistentRead set to true will consume twice as many read capacity units, as compared to leaving ConsistentRead at its default value (false). By default, the Scan operation processes data sequentially. DynamoDB returns data to the application in 1 MB increments, and an application performs additional Scan operations to retrieve the next 1 MB of data. The larger the table or index being scanned, the more time the Scan will take to complete. In addition, a sequential Scan might not always be able to fully utilize the provisioned read throughput capacity: Even though DynamoDB distributes a large table's data across multiple physical partitions, a Scan operation can only read one partition at a time. For this reason, the throughput of a Scan is constrained by the maximum throughput of a single partition. Segment — A segment to be scanned by a particular worker. Each worker should use a different value for Segment. TotalSegments — The total number of segments for the parallel scan. This value must be the same as the number of workers that your application will use. 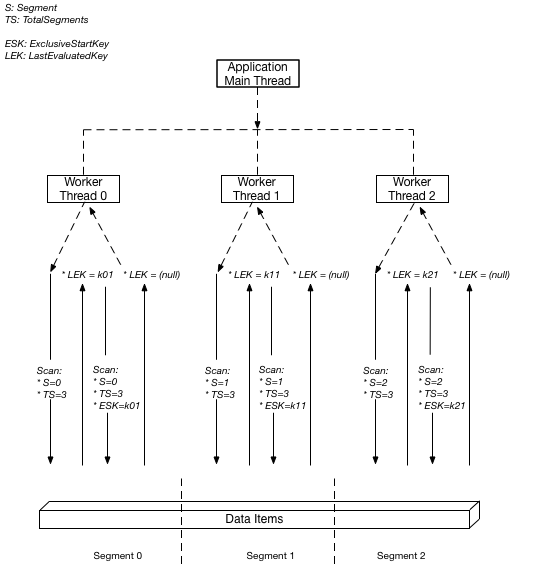 In this diagram, the application spawns three threads and assigns each thread a number. (Segments are zero-based, so the first number is always 0.) Each thread issues a Scan request, setting Segment to its designated number and setting TotalSegments to 3. Each thread scans its designated segment, retrieving data 1 MB at a time, and returns the data to the application's main thread. The values for Segment and TotalSegments apply to individual Scan requests, and you can use different values at any time. You might need to experiment with these values, and the number of workers you use, until your application achieves its best performance. A parallel scan with a large number of workers can easily consume all of the provisioned throughput for the table or index being scanned. It is best to avoid such scans if the table or index is also incurring heavy read or write activity from other applications. To control the amount of data returned per request, use the Limit parameter. This can help prevent situations where one worker consumes all of the provisioned throughput, at the expense of all other workers.